Dzogchen is 'The Great Perfection', the apogee of Tibetan Tantric Buddhist meditation accomplishment. It is the Buddha's enlightenment in rainbow light. Dzogchen is also a path of existential praxis which is the quintessence of all Tantra. But it cannot be taught or learned. Either you get it or you don't. It is the school of Buddhism with greatest affinity to the sanity of twenty-first century mystical aspiration. 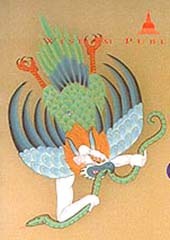 A sign of Dzogchen is the Garuda, a mythical bird, Khyung or Kading in Tibetan, an ancient sun-god, the celestial bird sometimes with human face. The exposition of Dzogchen is conventionally expressed in terms of Vision, Meditation and Action. The mystical jargon is highly abstract and abstruse. On the Dzogchen Teachings page the nature of Dzogchen is described by various adepts through the ages.